Kinetic has announced an exclusive UK distribution partnership with Voyager, the world’s first full-motion cinematic Virtual Reality (VR) chair. The partnership is through Kinetic’s startup incubator, KineticX, which is focused on technologies shaping the future of Out-Of-Home advertising. Voyager is a full-motion platform designed for cinematic VR experiences. The specialised chair incorporates physical nudges, including haptic feedback, motion and scent, which layer for a truly immersive user experience. Created by US-based VR technology studio Positron , the platform recently worked with Universal Pictures to support the 2017 release of The Mummy at this year’s #SXSW festival. Rosh Singh, of KineticX, told us “Virtual Reality is one of the most significant advancements in entertainment technology in the last 20 years. However, there are still a number of problems with existing platforms, often leaving a chasm between expectation and reality and hindering VR’s true potential among consumers. 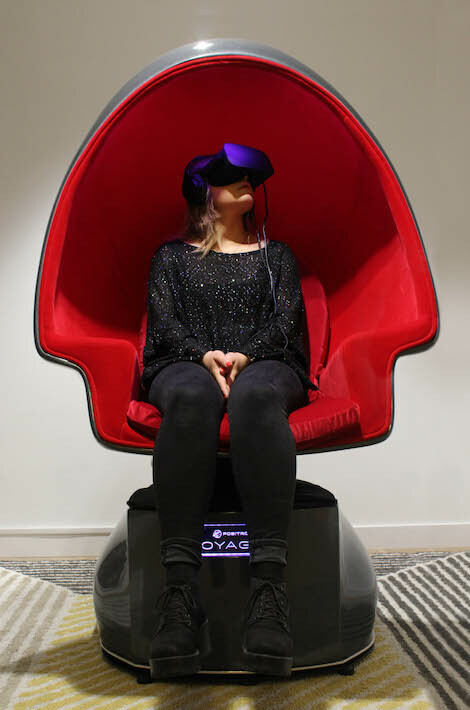 Voyager tackles those problems by taking users on a truly multi-sensory journey, incorporating pitch and 360 degree rotational motion, haptic feedback, spatial sound and scent to trigger as many senses as possible. These synchronised inputs allow users to become fully immersed in the cinematic VR experience while enjoying premium seated comfort. Voyager also solves the VR motion sickness problem by offering gentle motion that is motivated by the content, with 99.8% of users reporting a pleasurable experience with no discomfort. KineticX was launched in February 2017  in response to the increasing rate of technological advancements impacting the location and out-of-home advertising market. The programme actively shapes how brands connect with audiences on the move while offering brands innovative solutions and providing early-stage businesses with access to Kinetic’s broad client base. Positron is a VR technology studio based in Los Angeles that is focused on cinematic VR. The team includes mechatronics engineers, designers, software developers and artists who collaborate together to create premium VR experiences and products. Voyager™ is the first full-motion chair platform designed for cinematic VR. Integrating beautiful design and high-end engineering, it reflects a passion for VR storytelling. Voyager™ delivers a completely new level of immersion in VR by providing a comfortable, fully integrated personal VR theater that incorporates gentle motorized yaw and pitch motion, audio-driven haptic feedback and specialized seating. Its unique software and hardware technology integration enables nuanced motion and haptic tracks to be encoded along the featured content’s visual and spatial audio tracks. The chair precisely guides the viewers’ attention to points of interest in the experience, while also allowing a viewer-controlled motion mode. Voyager™ units are available now for select theaters, hotels, concerts, and events that desire to provide a premium VR experience.